Google ended the year with 63.5 percent market share of all search queries performed in the U.S., estimates comScore. And that market share has inched up steadily from 58.5 percent in January, 2008. But the market share numbers mask the absolute growth in searches and how Google has ben able to Gobble up all of that growth. The chart above tells a clearer story. 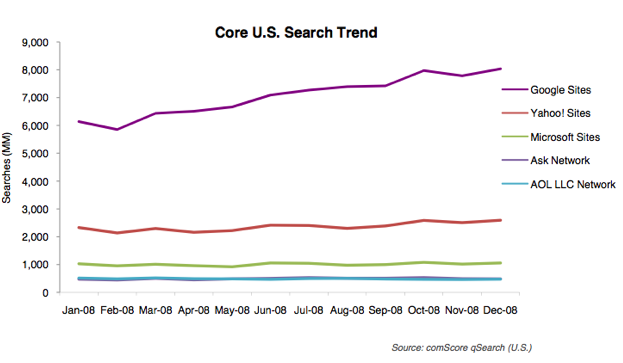 It comes out of the comScore 2008 Digital Year In Review, and shows the share of raw number of search queries in the U.S captured by the five major search engines. All the lines are pretty flat, except Google’s (the purple one). Of the 137 billion estimated total searches performed in the U.S. last year, 85 billion were done on Google. What’s even more impressive is that nearly 90 percent of all the growth in search volume was also captured by Google. Most of that growth came from increasing the number of searches per person, rather than bringing more people to Google.